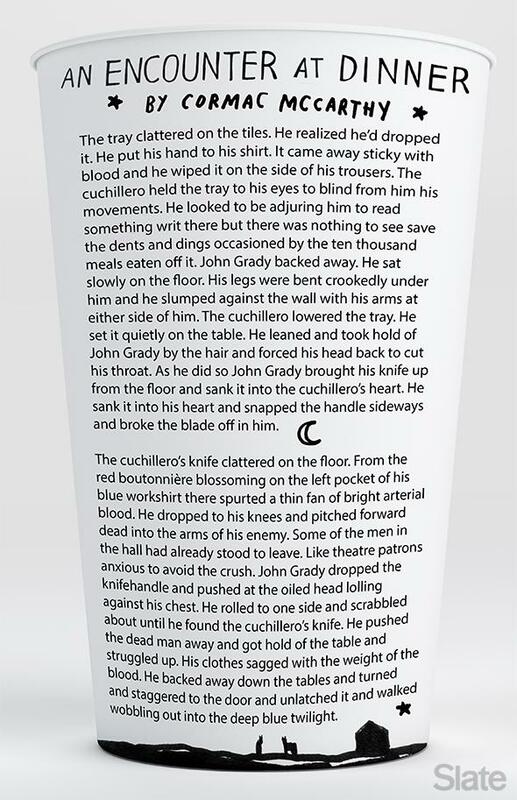 Chipotle Cultivating Thought cups: Cormac McCarthy's rejected contribution (PHOTO). This morning Chipotle announced a new project that will bring the work of such authors as Toni Morrison, George Saunders, and Malcolm Gladwell to cups and bags at their establishments. The idea was hatched by another author, Jonathan Safran Foer, who also contributed a short piece to the endeavor. * The passage printed on the cup is actually from All the Pretty Horses. Cormac McCarthy never submitted it to Foer or anyone at Chipotle, so far as we know.